Physiotherapy treatment including joint mobilizations and manipulations, specific muscle re-education exercises and soft tissue mobilizing techniques have all been found to be useful in the treatment of neck pain from acute through to chronic stages of the condition. 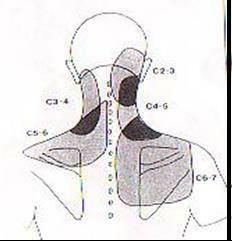 The patient may present with aching within the area of referral for the affected facet joint(s), restricted neck mobility (particularly with rotation, such as difficulty reversing in the car), and sharp pain with end range movement. Joint mobilisations and manipulations, muscle stretches, muscle re-education (strengthening) exercises, postural exercises, thoracic mobility, neural mobilising techniques, and patient education are all important components of physiotherapy treatment for non-specific neck pain. Joints that look degenerative on x-ray do not necessarily have to cause pain. If the joints are mobile and the muscles are strong and flexible, then the patient can expect to have excellent pain free movement and function. It is important to “move it or lose it”.